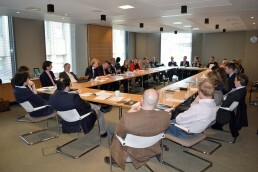 The Ethical Finance Roundtable was held on Feb 27th at Baillie Gifford in Edinburgh. Entitled "Ethical Finance Approaches in the Debt Capital Markets", the round table covered market developments in the $1.45 trn climate-aligned bonds market (such as green bonds) along with innovative trends in ESG and SDG bonds. The $100bn is typically deployed through: 1) bonds 2) loans and 3) investments where HSBC maintains a focus on returns. The green agenda is being driven by regulation where some governments are taking measures that encourage responsible lending in the private sector. The Paris Agreement, which set out national contribution guidelines in the form of NDCs, prompted legislation such as the Clean Air Act in the UK. 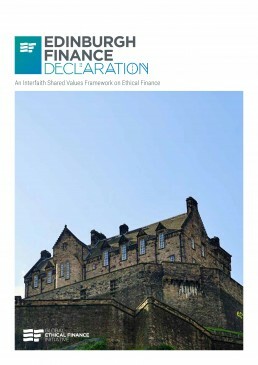 Furthermore, in France, the Government issued Law 173 in making investors disclose green assets from brown banks are obliged to rebalance their assets with a higher ratio of green to brown. HSBC is a leader in green finance and is committed to investing in green assets that drive the market forward. With the examples of Clean tech growing by 4% to 5% Graham suggested that investors should be interested in the space green or not. 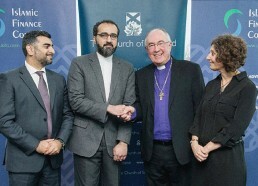 In March 2018 the Green Loan Principles were published. Graham explained that this important development, with a similar rationale to the Green Bond Principles, applies to broader sections of business and society and has now become the “gold standard” for green loans. Banks can now offer products that they understand. Graham explained the emergence of products (such as green, social, sustainability bonds and loans to transition loans) and that the Loan Association is likely to provide a much-needed definition for ESG loans in March this year. With ESG products positioning businesses as good corporate citizens and green products highlighting a commitment to the environment there are PR benefits to be derived from businesses engaged in sustainable finance. In terms of pricing, there is no financial penalty for investing in green bonds but they still prove costly for issuers. HSBC launched the world’s first bond that directly supports the SDGs and the Paris Agreement. The US$1 billion raised through the bond finances projects that benefit communities and the environment, including hospitals, schools, small-scale renewable power plants and public rail systems. The key message is that regulations are driving the development of the market, leading to change at the commercial level. A prime example is the Task Force on Climate Related Financial Disclosure (TCFD). Caspar Cook (Head of Analysis, Cameron Hume) then outlined Cameron Hume's client-led approach to ESG, which focuses on a combination of values-based and returns-based strategies, and how this has evolved to successfully grow the Global Fixed Income ESG Fund. Cameron Hume, an active fixed income specialist, is a signatory to UN PRI. Caspar started by explaining the considerations of applying an ESG approach to fixed income, which differs from its integration into equity investments. There remains a lot of confusion as to the definition of ESG so Cameron Hume has divided its approaches into two categories: returns-driven (ESG factors that are material to performance) vs values-driven (implement ethical social and environmental objectives of different investors). Cameron Hume focuses on returns-driven investment and only practices values-driven investing in segregated accounts that mandate it. Caspar believes that ESG is a good risk indicator and cited the example of PG&E, a prolific bond issuer known as the cleanest provider of energy in USA. Carbon conscious investors would have found this an interesting play but they filed for bankruptcy following their link to the California wild fires. ESG analysis, using MSCI, would have highlighted risks relating to its poor land use and diversification thereby discouraging investment. A further example was shared by Caspar. Equifax, the biggest US credit scoring company, had a substantial data breach recently that severely impacted its shares and bonds. MSCI had ranked Equifax 1 out of 10 in data security and flagged this as a material risk. These factors do not typically appear in annual accounts or financial ratios that many investors focus on. ESG factors help investors focus on neglected risk that leads to more sustainable long-term investing. Cameron Hume’s Global Fixed Income ESG Fund uses responsible investing to bring ESG factors in to the investment process tilted towards higher ESG rated companies. It is easier to influence sovereigns through the bond markets than corporates. ESG policies in businesses tend to be top down and not always filtering to the bottom layer of people making decisions. ESG factors influence investment performance but not necessarily on a consistent basis. Some studies show that it can add 0.5% to 0.8% a year in performance. Participants were skeptical because it is hard to disentangle ESG from other factors. Clients have fiduciary duty towards performance so it is a challenge for fund managers to integrate a universally agreed ethical stance into a portfolio (e.g. Calpers divested from tobacco stocks 15 years ago and recently published that that decision cost them USD6bn). 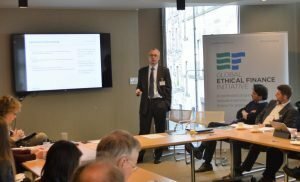 Even if findings suggest that ESG is good for performance over the last few years there is a lack of evidence indicating that it will improve performance going forward. The bond industry must evolve to ensure bonds fulfil their green promises. At the moment they just get declassified but there should be penalties. And declassification often takes place long after the bond has de-greened (e.g. Mexico City airport project). At the moment the industry tends to tick boxes and gets PR recognition for this (e.g. the CDP used by the TCFD). There is no perfect measure for transition risk, which will play a key role in consolidating many sectors in the medium term. A nuance that influences the development of the industry positively is that asset managers pay for MSCI scorings while issuers pay for credit ratings. As investors increasing focus on analysing and challenging data a virtuous cycle will be created to drive up the availability and quality of data. A limitation on green bond reporting is the risk of breaching client confidentiality. Debt instruments that provide a coupon as well as a social or environmental return are broadly dubbed as ethical debt instruments. They come in a variety of forms, and innovative new structures are increasingly coming to market. The major driver of this is investor demand (such as pension funds, insurers and millennials) and issuers keen to tap into this rich pool of investment capital at equal to lower cost than purely financial return focused bonds. Investors increasingly believe that these forms of debt financing better capture long term and existential risks as well as seek to provide non-financial returns. The most important factors to focus on when evaluating such instruments is whether the issue meets a common set of Social Bond Principles, namely use of proceeds, project or investment selection process, management of funds in accordance with a pre agreed framework that has been evaluated by a third party (e.g. Sustainalytics or CECERO) and aligns with a recognized global or national set of principles (such as the Green Bond Principles, the Social Bond Principles and/or the Sustainability Bond Guidelines) and impact metrics monitoring and reporting. By far the largest ethical debt market place at the moment, with USD11.9bn issued to date in 2019 alone. Last year there was USD167.3bn in issuances. This year is forecasted to mobilise USD250bn in issues. The majority of these bond issuances are aligned with the Climate Bonds Initiative to provide environmental integrity. A few are certified by the climate bond standard which is backed by a board of investors that represent USD34tr in AUM. Essentially the proceeds of the bond must be used in areas that are consistent with the 2-degree Celsius warming limit specified in the Paris Agreement. BNP Paribas is consistently in the top five underwriting league tables for green bonds. Several stock exchanges have a dedicated section allocated to green bonds, such as Oslo, London, Mexico, Luxembourg, Italy, Shanghai, Taipei, Johannesburg and Japan. Interestingly the US, China and France are the largest sources of labelled green bonds. Issuers range mostly from multi sector to energy or building related. Structures are sophisticated and diverse ranging from covered bonds and asset backed securities to green Schuldschein, green sukuks, mortgage backed securities and medium-term notes. Apart from issuing its first green bond (USD500mn) as early as 2015, HSBC has also issued an equity linked green bond for EUR34mn (2017) that pegs returns to the performance of a basket of ESG compliant listed companies that are measured against 134 KPIs (STOXX Europe ESG Leaders 30 Index). The proceeds are dedicated to projects that improve energy efficiency. SDG bonds are a type of sustainability bond that aligns the projects it finances or refinances with social and / or environmental impact linked to specific SDGs. These may include all the SDGs or only some of them, such as in the case of the ANZ SDG Bond that seeks to contribute to the achievement of nine of the seventeen goals including health, education, sustainable cities and climate action or the HSBC UN SDG Bond that uses proceeds towards projects that achieve one or more of seven specified SDGs including clean water, energy, education and infrastructure. In both cases the proceeds can also be used on its own operating or capital expenditures as long as it contributes to the achievement of one or more of the nine SDGs identified. In HSBCs case the bond is majority invested in two of its LEED Gold certified headquarters in the Midlands and in Dubai. The HSBC bond which was launched in 2017 was USD1bn, 3x oversubscribed and matures in 2023. The more recent SDG bond issued by the World Bank links return on investment to the stock performance of thirty listed companies that make up the Solactive Sustainable Development Goals World MV Index. Proceeds will be used to finance their development projects. BNP Paribas arranged the bond while Banque SYZ placed it. These are bonds that raise financing for projects that support the sustainable use of ocean resources, inspired by the green bond movement but at a naisant stage. Only one issuer has raised a blue bond so far and that is the Seychelles, an island highly dependent on the ocean for its livelihood. The issue size was a modest USD15m and the coupon is part guaranteed by the World Bank and the Global Environment Facility. Considering the size of the issue only three investors participated: Calvert Impact Capital, Nuveen and Prudential. Vaccine bonds were in fact pioneered in 2006 by the International Finance Facility for Immunisation (IFFIm) launched by GAVI (The Vaccine Alliance) and began the movement by the financial sector towards developing a set of principles to hold the socially responsible bonds universe together. Vaccine bonds are directly aligned to SDG 3, which aims to end the preventable death of children under 5 years of age by 2030. GAVI has been able to raise USD5.7bn so far as effective bridge financing until grant providers can step in. Other kinds of social & development impact bonds include Tobacco Social Impact Bonds (TSIB), a rhinoceros conservation impact bond, a cocoa and coffee production bond in Peru and a youth unemployment program bond in Serbia. Sometimes referred to as a pay for success model or a social benefit bond, these innovative financial instruments tend to be driven by private investors with an interest to offer upfront capital for a particular and specific social or environmental goal. These investors work with governments, philanthropists and/or aid donors to come up with mutually beneficial structures that reward them if outcomes are met. Although the green bond marketplace has taken off well over the last few years, it is not enough to fill the USD3 to USD5 trillion annual gap that is required to meet the SDGs. Banks are in a perfect situation to align just part of their broad loan books towards SDGs that are material to them to drive more capital towards the achievement of the SDGs. Certain sectors can be identified as most closely aligned and a framework for tracking and reviewing annually can be put in place based on industry learnings from the green bond issuance space. As a result, banks will not only be able to expand their product offering and client base but also support their clients who wish to similarly begin engaging with and reporting on their contributions to the UN SDGs. HSBC is an active lender in the sustainable finance industry globally and a member of The ICMA Green Bond Principles Executive Committee, The Catalytic Finance Initiative, The Equator Principles Association, The WEF Climate Leaders CEO Group, The Climate Bonds Initiative, The Social Bond Guidance Steering Committee, China’s Green Finance Committee, and the Adopted Taskforce on Climate Related Financial Disclosure. It is the founder of the HSBC Centre of Sustainable Finance and the award-winning Climate Change Centre of Excellence and the first sovereign Green Bond arranger (EUR750mn Polish Bond 2016). 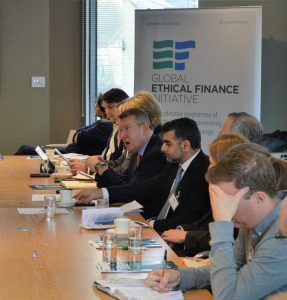 HSBC will be speaking at the Ethical Finance Roundtable in Edinburgh hosted by GEFI on Feb 27th 2019. To be considered for an invitation, please click here.